Professor Jay Brandes wrote this report from a short research cruise to the Gulf Stream this past weekend. This last Friday-Saturday, I had the opportunity to tag along with a group of 15 K-12 teachers and Dr. Marc Frischer, who was leading them on a cruise out to the Gulf Stream. It was to be the highlight of a weeklong intensive workshop on ocean literacy for the teachers, and the first time that many of them had been on a ship out of sight of land. R/V Savannah pulling away from the dock. I came along to do a little preliminary reconnaissance for possible traces of oil and for plastics in the South Atlantic Bight region. There has been a considerable amount of concern about oil being carried by the Gulf Stream / Loop Current (see previous posts) from the Deepwater Horizon Spill. While no satellite imagery or other data has suggested that large amounts of oil has reached the Gulf Stream, it is always possible that smaller amounts could have been carried into the current. Thus it makes sense to take a look for oil traces. Given the timeframe of the cruise (leaving at 4 pm Friday, getting back at midnight Saturday night) there wouldn’t be enough time to conduct an exhaustive survey. However, there was enough time to do a few quick tows. In addition, I wanted to see how much plastic contamination might be out there. Most of us have seen the reports on the “great Pacific Garbage Patch”, and there is a lesser one out in the middle of the North Atlantic as well. But little data exists for out coastal waters. Unlike the sheets of oil seen in the Gulf, the oil reaching our region is expected to be weathered and broken up into smaller pieces, called tar balls. If they are widely spread out, as expected, then the best and fastest way to collect them (or search for them) is to use what is called a “neuston” net. Neuston refers to organisms living at the sea surface. 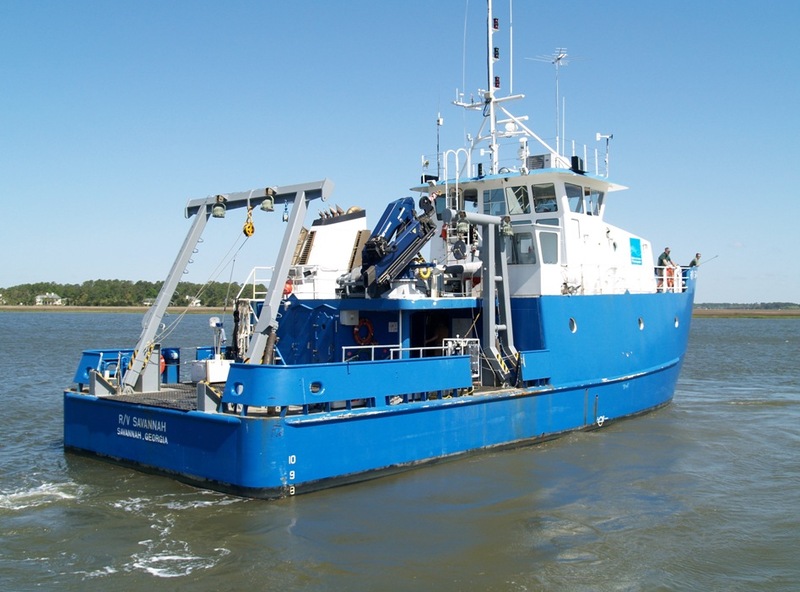 Such a net is designed be towed behind or beside the research vessel, right at the surface. Scientists also have used such nets to collect floating plastics in the ocean. We conducted four surveys, towing our net for a half hour in the middle of the Gulf Stream, its edge, the outer shelf, and the middle shelf. We found no tar balls or other oil residues in any of the samples, which was a relief. While I have to caution that these were just small surveys (the net is only 2 meters wide by 1 deep), and it is a big ocean, the lack of any sign of oil is at least a positive sign. However, the same could not be said about plastics. 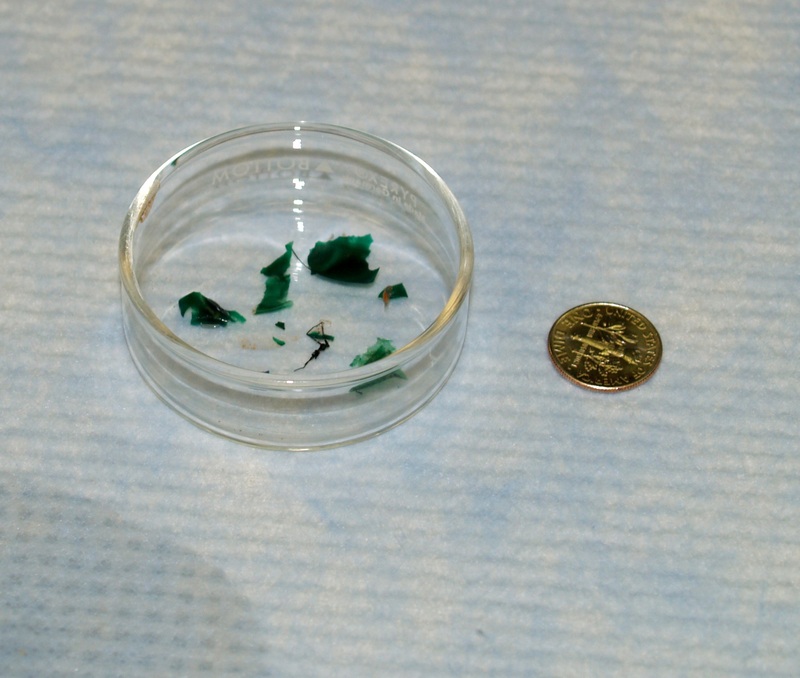 We found small plastic pieces in all of our net samples, ranging from 1-2 mm size tiny particles to larger pieces a few cm across. One would not see these in looking out from a boat, unlike the big pieces found in the “garbage patches”. But they are of a size that will interfere with marine organisms, because they can be ingested. Overall, the levels of plastics were low, and I feel that I can describe our offshore environment as relatively pristine, from this standpoint. It is up to all of us to keep it that way. Earlier this month a group of experts from the institutions of the South Atlantic Sea Grant Program gathered at Skidaway Institute for a discussion of the Gulf of Mexico (GoM) oil spill and its potential effect on the Atlantic coast. Here is an abbreviated summary of their conclusions. (1) oil released at the Deep Horizon (DH) site and moving within the GoM, (2) oil in various forms that may be “captured” by the Loop Current and then transported into the Gulf Stream, and(3) the potential for oil in its various forms to move in a westerly direction from the Gulf Stream toward our nearshore waters and the southeastern coastline. * Despite estimates by BP and federal agencies, the amount of oil that has spilled into the GoM is essentially unknown. The actual volume of oil spilled there will affect the chances of it reaching South Atlantic waters. *Authorities in the Gulf have no firm grasp as to where spilled oil – in its various forms and concentrations – can be found within the GoM’s water column and geographic expanse. Where oil lies in the Gulf, and at what depth, could play a substantive role in its entrainment in and movement via the Loop Current. * It is still highly speculative to pinpoint the location, depth, and amounts of GoM oil that might eventually be captured and transported by the Loop Current over specific periods of time. Understanding the sourcing, amount, and timing of spilled oil bleeding into this major GoM current is critical to understanding the oil’s possible ultimate transport to the southeastern U.S. region. * Major questions exist about the nature of the spilled oil. For instance, how much oil has dispersed or has been degraded? How much will be degraded in coming weeks and months? And what are the physical and chemical forms that such degraded oil will take (e.g., slicks, tarballs, underwater plumes, diluted at various concentrations, etc.). Such degraded oil outcomes could affect how spilled oil will move. * Much is known about how general ocean circulation typically works in the GoM and South Atlantic Bight, due to our knowledge about the GoM’s Loop Current, the Atlantic’s Gulf Stream, and the interrelationship between them. There was unanimous agreement that the Loop Current and Gulf Stream would be the main “conveyor” of the Gulf oil should it move to South Atlantic waters. * The first major step in any movement of Gulf oil to the South Atlantic would be its entrainment in the GoM’s Loop Current. In recent weeks, the Loop Current has been “pinched” at its ox-bowed (loop) narrowing, creating an eddy separated from the Loop Current itself. This fluctuation, manifested as a separated eddy, has acted as a barrier to major movement of oil into the Loop Current. Thus, that action may have prevented and delayed the movement of oil toward the Atlantic. See an animated depiction of this eddy in relationship to the Loop Current here. * The separated eddy now present in the Gulf, however, will either drift to the west (which is good), as it will take entrained oil with it, or reconnect to the Loop Current in the near future (not so good); the controlling factors being seasonal weather trends and events and perhaps other factors that are now poorly understood. A more fully developed Loop Current resulting from re-attachment could reach farther north into the GoM and therefore closer to the spill zone center, likely capturing more oil in various forms and more fully channeling it toward the Florida Straits and possibly the Gulf Stream. Once within the Loop Current, that oil could move from the GoM to the coastal waters off Cape Hatteras, NC in about a month’s time under typical weather conditions. * Once oil borne by the Loop Current reaches the southeast end of the Florida peninsula, it then could become captured by the Gulf Steam and move to the north, offshore of the east coasts of FL, GA, SC, and NC. * The risk of having oil spill residuals come ashore along the southeastern coast would be greatest along the southern portion of Florida’s east coast, due to the close proximity of the Gulf Stream to that shoreline. Factors affecting the prospects and amounts of oil reaching the shoreline include shearing and eddy effects along the Gulf Stream’s west (inshore) edge, prevailing winds and their speeds, and acute weather events. * A second area in the South Atlantic that would be at higher risk for oil spill residuals coming ashore is at North Carolina’s Cape Hatteras and neighboring Outer Banks beaches. Again, this would be mainly driven by proximity of the Gulf Stream to the shore and weather events, but also by onshore eddies and jetting actions caused by interactions of the Gulf Stream near Hatteras with southerly flowing currents of cooler water from the north. * Shorelines and waters between south Florida and Cape Hatteras also could experience visible oil deposits, diluted concentrations of oil, and other effects. Manifestations of oil will likely be more highly dependent on acute weather events (significant coastal storms), prevailing wind direction and speeds over set periods of time, and seasonally-related perturbations (e.g., eddies, meanders, “spin-offs”) along the inshore (western) edge of the Gulf Stream. * Due to the greater width of the continental shelf off of South Carolina, our shoreline and waters are less likely to be impacted by Gulf oil. Deep hard-bottom reefs and fisheries would be more vulnerable in conjunction with upwelling of deep Gulf Stream waters associated with spin-off eddies, while coastal wetlands and estuaries would be the least vulnerable. *The expert panel noted that the longer Gulf oil remains at sea, the more likely natural degradation of the oil could take place. As such, it is possible that oil reaching south Florida waters may be in more visible forms (such as sheens, slugs, and tarballs); while oil that makes it to Hatteras waters may be more diluted and dissolved – and, if conspicuous at all, perhaps only be seen in forms such as water color/turbidity differences, thin oily residues on contact objects, and smaller tarballs. The summit concluded with a brief discussion of secondary (but highly significant and concerning) effects of oil (and chemicals used as oil dispersants) reaching southeastern U.S. waters, which could include impacts on coastal fish, animal, and aquatic plant health, seafood contamination issues, and compromised coastal ecosystem functioning. It could take years to observe, document, and experience these adverse effects. Unfortunately, our coastal observation networks and infrastructure in and along the southeastern U.S. coastal waters and shorelines are currently inadequate to effectively monitor and measure such adverse effects in a timely manner. As a result of the meeting, the four Sea Grant programs in the South Atlantic region will further develop a regional website regarding Gulf oil spill information, which can be found here. Skidaway Institute scientists assembled this list of Web sites with information on the Gulf of Mexico oil spill and it’s potential effect on Georgia. This is not intended to be a complete list. Links and information for several Atlantic coast states, including Georgia. The NOAA Office of Response and Restoration (NOAA National Ocean Service) is providing coordinated scientific weather and biological response services to federal, state and local organizations. Includes links to daily forecast trajectory maps – these show plume boundaries but do not represent the underlying surface currents, so not very satisfying from an oceanographic perspective. As reported on the website, there are regular aircraft surveys (e.g., Coast Guard) to try to document surface slick boundaries. Also links to a number of other NOAA and other agency web sites that provide spill impact/response information (including the following NWS site). Online GIS mapping tool developed by NOAA and the University of New Hampshire Coastal Response Research Center. Lots of information layers can be plotted, including wind, currents and spill trajectory forecasts. Marine forecasts in the spill-affected area, links to observations, model forecasts, satellite imagery. Lots of graphics links. Recent and earlier imagery from NASA satellites and aircraft sensors (e.g., high spectral resolution radiometers) and descriptions of the sensor systems and various survey results. Hosted by Rutgers COOL web site. A number of the Rutgers glider “fleet” have been deployed to the shelf/slope off Louisiana and along the West Florida shelf. Lots of links to recent glider sections, and other webs sites for models, satellite imagery, surface drifter tracks. Hindcast/forecast results from several numerical models. These generally hindcast 1 day and forecast 2-3 days. Some use recent satellite data (visible imagery, and perhaps synthetic aperture radar, SAR) to update the best guess of the surface oil plume boundaries. see “Global HYCOM”, “Navy GOM HYCOM”, “SABGOM” model run links. Satellite imagery using high resolution Synthetic Aperture Radar (SAR), visible imagery (MODIS) and some high resolution photography (SPOT). Imagery at this web site is acquired and processed by the Center for Southeastern Tropical Advanced Remote Sensing (CSTARS) group at the University of Miami (RSMAS). SAR imagery is from Canadian, European and Italian satellites (some being operated by private company/government agency consortia, e.g., the Italian “COSMO-Med”). ROFFS (Roffer’s Ocean Fishing Forecasting Service, a private firm) isutting together their best estimates of the surface oil plume from satellite SST and ocean color data products overlaid on estimated surface currents. There was a gap in early June, but it looks like they have resumed regular updates. Dr. Dana Savidge provides the following update on the Gulf of Mexico Loop Current and the Deep Horizon Oil Spill. At present a Loop Current Ring has separated from the northernmost portion of the Loop Current, and stands between the Deep Horizon well and the Loop Current itself, so that most of the spilled oil has not been entrained into this strong current. 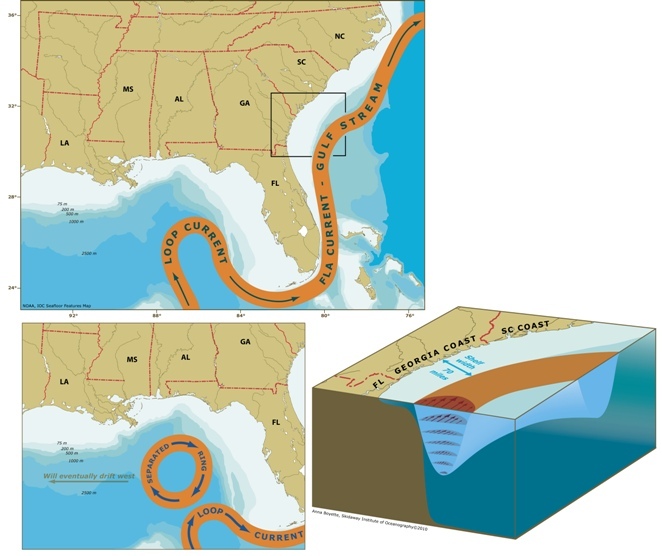 Over time, that ring may reattach and detach several times, and will eventually drift gradually westward in the Gulf of Mexico. When that happens, the Loop Current may eventually re-extend into the northeastern Gulf, and entrain spilled oil into the Loop Current. Dr. Dana Savidge provided some insight into the computer models (See here.) that project oil from the Gulf spill reaching the Atlantic coast. The large scale UCAR models get processes 90% right, but, of course, the devil is in the details, and the details (with respect to concentration, form, and approach of oil to the coast) are NOT resolved by these models AT ALL. All of these things will happen. We do not know how much, how fast — but all of them will reduce the amount of oil arriving off our shores relative to the model projections, because the model includes no loss terms. In addition, the “alarmist yellow” of the color scale does not convey intuitively the great extent to which oil will diluted during its transit. Another important point is that these large scale ocean models are designed to simulate open ocean conditions away from coast. Coastal boundaries — including all of continental shelves — are poorly represented in these models, which means that any results that show oil reaching (or not reaching) the coast should not be considered reliable forecasts. They are more like random noise or blur at the edges of the bigger image. The UCAR text associated with the model runs on the web goes into this a little bit, but not as much as it should. 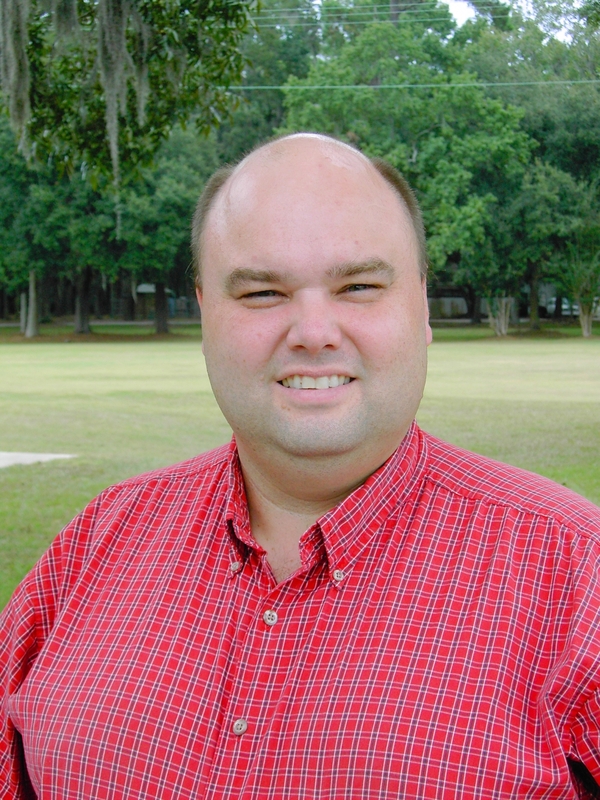 Skidaway Institute’s Jay Brandes is attending a conference of scientists discussing the Gulf spill in Baton Rouge, La. Here is his first report on the meetings. This morning we had a summary by members of USGS, NOAA and NSF about what is going on in the gulf. In a word, there is a lot going on. NOAA has had surveys, modeling, measurements going on from day one (literally, the first models for spill tracking were started within 12 hours of the rig sinking). Lots of emphasis on understanding the system pre-spill, then moving towards understanding spill effects with that background. 3000 samples collected so far, all types. They all emphasize that it will be decades before the last spill effects are known/remediated. They understand that there is a lack on information on these activities, and are working on some sort of unified web page to act as an information clearinghouse.